Welcome to Corsica! When you arrive at Bastia airport, locate your private transfer and make your way to your hotel on the Bay of Saint Florent, where views of the deep blue Mediterranean and the imposing Corsican mountains await. Spend this first day relaxing at the beach, the pool, or the chic port of Saint Florent. Enjoy a one-Michelin-star dinner at the hotel restaurant. And rest well - tomorrow is your first day exploring the island on foot. 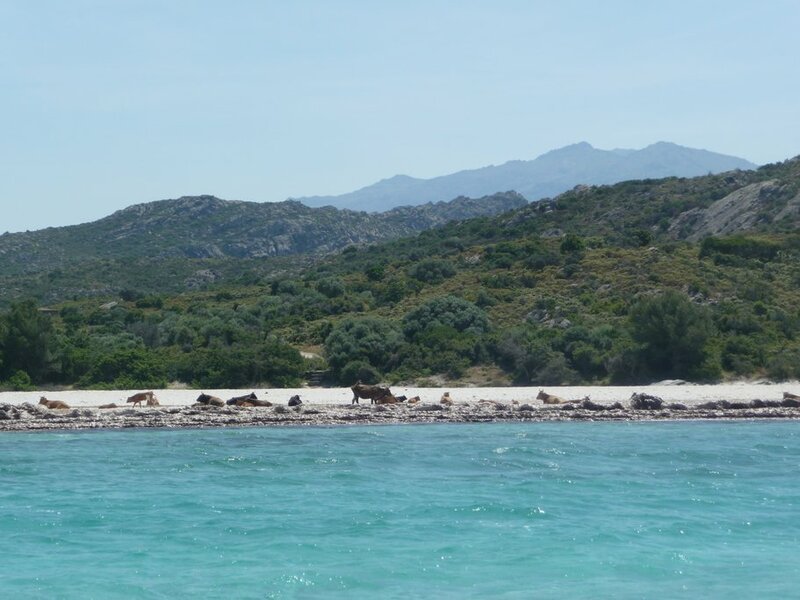 Start your first full day with a hearty breakfast and a thirty-minute boat ride from Saint Florent to the most beautiful beaches on Corsica: Saleccia and Lodu. 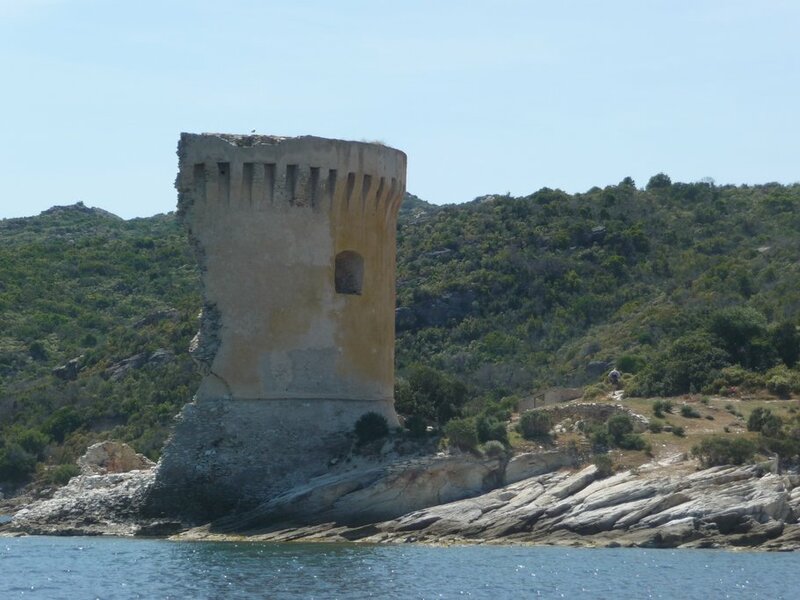 From here, a coastline walk winds past hidden creeks and through the wild maquis (Corsica's aromatic herbs and wildflowers) to the ruins of the majestic Genoise Mortella Tower. After the tower, the coastal walk continues all the way to Saint Florent and your hotel. 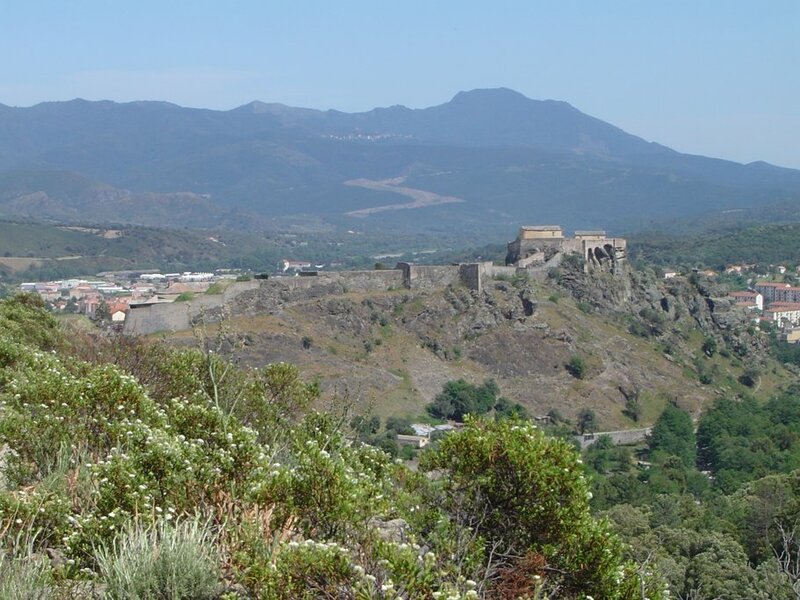 Spend your morning enjoying the cafe culture of Saint Florent before heading inland, through the Agriates Wilderness - a desert landscape of low green scrub checkered with gray stone - and into the heart of the Balagne region. 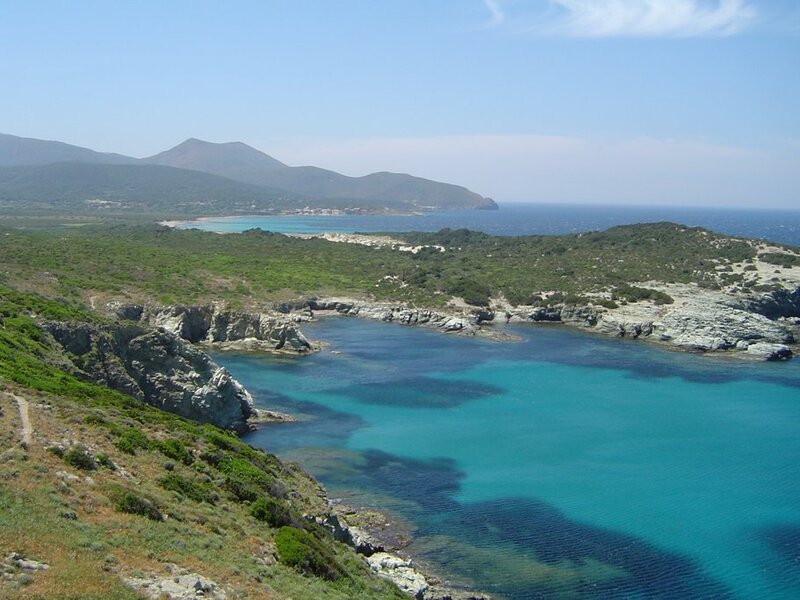 Formerly known as "the Garden of Corsica," this region is full of rolling hills that tumble toward the sea. It's also known for olives and olive oil, so if you're a foodie, make a point to try some while you're here. When you arrive at the seaside town of Calvi, take some time to wander around old town and the Medieval citadel overlooking the bay. If you're up for more walking, take the trail to Notre Dame de la Serra Chapel for breathtaking views over the bay. Or catch a boat to the Scandola Nature Reserve - a UNESCO World Heritage Site where striking red cliffs rise from the turquoise waters of the Mediterranean. 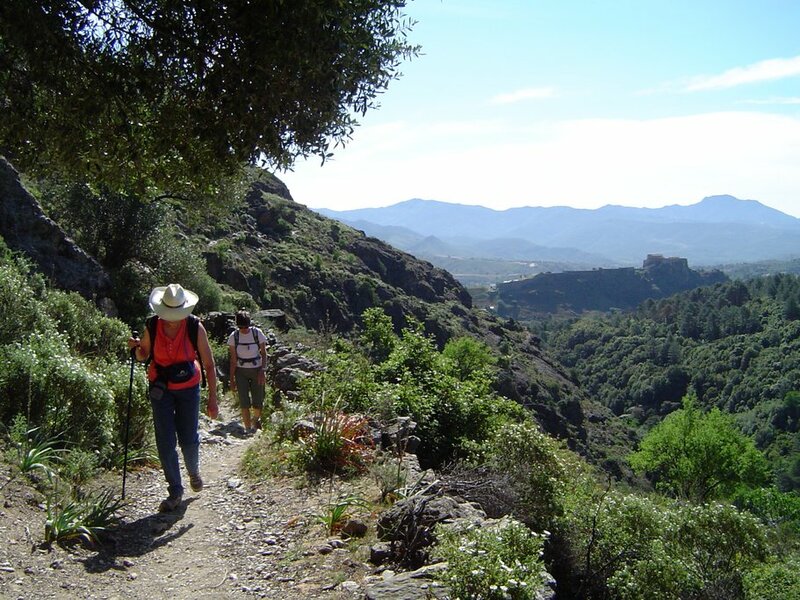 Today, you have the choice of two scenic walks, both starting from pretty coastal Calvi. 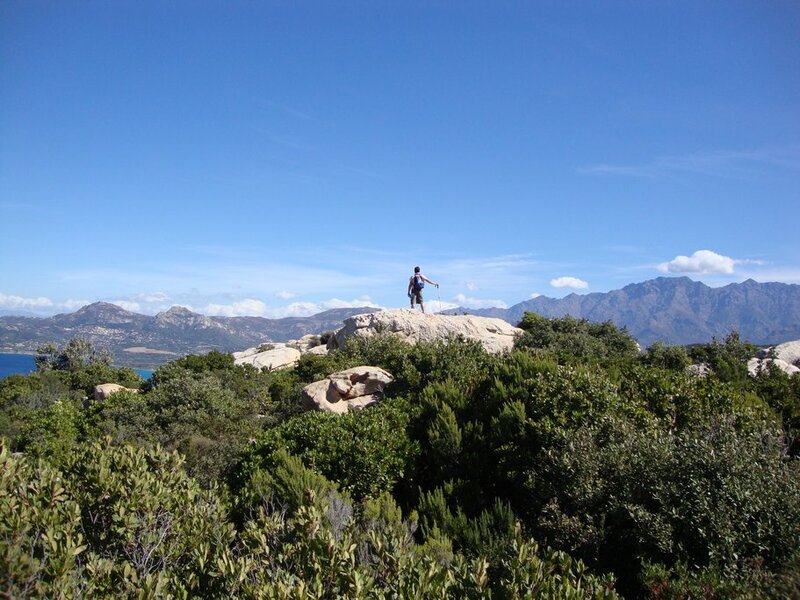 The first hike - to the Austrian Cross - makes its way 2,297-feet above sea level to the highest point above Calvi. Pause here to take in the panoramic views and savor the triumph of the summit. The second (less challenging) hike hugs the coast as it ambles toward the Revellata Lighthouse and its wild peninsula south of town. 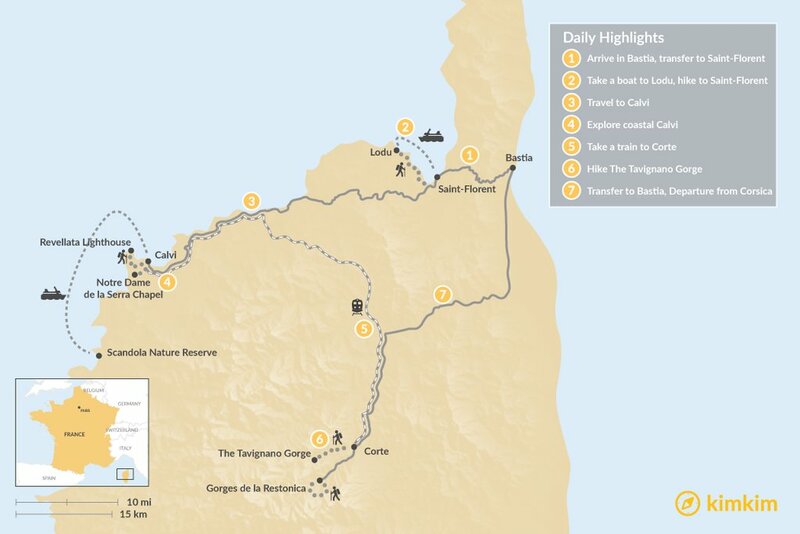 Discover another side of Corsica on day 5 as you board a train from the coast to the quiet, mountainous heart of the island. Disembark in Corte - the ancient capital of Corsica - where citadels rise from the cliffs and romantic cobblestone walkways are lined with roses. Make some time to explore the town center and the citadel, which also serves as the tourist office and a museum. And if you're feeling adventurous, head south to the Gorges de la Restonica for an easy, rocky hike and a dip in a freshwater pool. Overnight in a beautiful hotel beside the river. On your last hiking day, make your way through the citadel, past the museum, and to the other side of town, where the magnificent Tavignano Gorge beckons. Here trees and scrub rise up from the rocky hills and waterfalls cascade down them. Trek until you reach a bridge spanning the river and pause here for a relaxing swim in the crystal-clear rocky pools before circling back to Corte. After breakfast, a private transfer will take you back to Bastia to catch your ferry or flight. If you have time before your departure, explore Bastia's port and old town or relax on the pebble beach.